As a Digital alumnus with reverence for all things DEC, competitor IBM's big iron mainframes and operating systems have always been a curiosity. So far, my IBM experience has been with PC-DOS (here is a PC DOS 2000 based internet-facing web server), their incredible IBM OS/2 Warp, and recently IBM AIX on a virtual box. Inspired by Astr0baby's blog post and Jeff Sipek's guide, I decided to install Ubuntu 18 "Bionic Beaver" Ubuntu 18.04.1 LTS (GNU/Linux 4.15.0-36-generic s390x) on a Hercules-emulated IBM S/390 Mainframe computer running on OpenSUSE Tumbleweed inside a Oracle VirtualBox appliance. 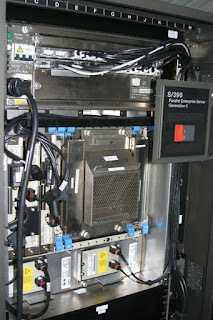 This is the first mainframe-class machine emulated at SANYALnet Labs. Hercules 4.0 Hyperion mainframe emulator was used for the guest S/390. "Hercules is an open source software implementation of the mainframe System/370 and ESA/390 architectures, in addition to the latest 64-bit z/Architecture." - Hercules official web page. Packages installed in preparation of OpenSUSE Tumbleweed as the build and execution environment for Hercules hypervisor include the following. The standard zypper package management tool for OpenSUSE was used. To get around this problem, the host (OpenSUSE) firewall daemon "firewalld" was disabled completely and a startup script was added to flush and clear iptables rules at boot time. Hercules had to be launched from OpenSUSE root account; even sudo from a user account did not work for letting Hercules access the tun adapter completely for networking. This is despite setting permissions on the /dev/net/tun, /use/local/bin/hercifc etc. as described in "Hercules Version 4: TCP/IP networking with Hercules". Since any desired Ubuntu packages could be installed later, only the "SSH server" option was selected in addition to the Ubuntu base install in the installation software selection options screen. Pressing ESC in the Hercules console screen toggles between a "graphical" view of the S/390 showing processor registers, the processor status word/flags, CPU usage, disk and network I/O etc. as in the example at the top of this post. Anything typed in starting with a period at the Hercules console's "herc ====>" prompt is sent on to the virtual guest directly (i.e. not processed by the emulator itself). Therefore, even if SSH access to the Ubuntu s390x guest is unavailable, it is possible to login to Ubuntu s390x by entering .username and .password starting with a period (i.e. a dot) at the beginning on the Hercules console, and execute Linux commands by typing them in starting with dots the same way. It is exciting to be able to run a mainframe version of Ubuntu as a hobbyist system! You can download free snippets of the experiment's session logs from my google drive. In addition. here are some random images of screenshots taken during having all this fun!